Could Nike Deal With Man United Be Worth £1B? Interesting piece in today’s Daily Mail about Manchester United’s kit deal with Nike, which is coming up for renewal in 2015. Back in 2002, United signed a 13-year deal with Nike worth £303 million, plus a profit share on retail sales. Even without any profits, that translates to around £23 million a season. The deal has been mutually beneficial to both parties with Man United fans buying 1.4 million shirts a year, tied with Real Madrid for most popular shirts worldwide. United and Nike are set to begin renewal talks in February, and United chief of staff Ed Woodward, who presides over the club’s commercial operation, is looking for a ‘major increase’ from Nike. Since United and Nike signed their current deal, shirt sponsorship has increased more than six-fold. Back then the Man United shirt sponsorship deal with Vodafone was worth £8m a season. Their new deal Chevrolet, which starts with in the 2014-15 season is worth an eye-popping £52m a year. Which is where the £1B number comes from. Based on the increased revenue from shirt sponsorship over the last 13 years, it is pretty reasonable to expect United to ask for a six times increase in their current deal with Nike. That translates into somewhere around £138 million a year. If it new deal is for the same length, 13 years, then United would earn £1.8B over the length of the contract. A simply mind blowing number. Keep in mind that no other English club comes anywhere near making £138 million a year from its commercial operations. This deal could then take United over the £200 million threshold, which would for the moment put then ahead of even Real Madrid and Barcelona in commercial revenue. While many point to Uefa’s Financial Fair Play rules as leveling the playing field amongst clubs, what it really does is strengthen the top teams. Under FPP teams can basically not spend more than they take in. So if you can generate £50, £75, or £100 million in revenue than your competitors you have a huge competitive advantage. You can pay more the top player, and you can pay them higher wages than anyone else. That in turn translates to more wins on the field, which in turn then generates more commercial revenue. That is why the winners of FPP will not be the Arsenal’s of the world who live within their means. It will be Real Madrid, Barcelona, Bayern Munich and Manchester United, whose commercial revenue streams dwarfs everyone else’s. 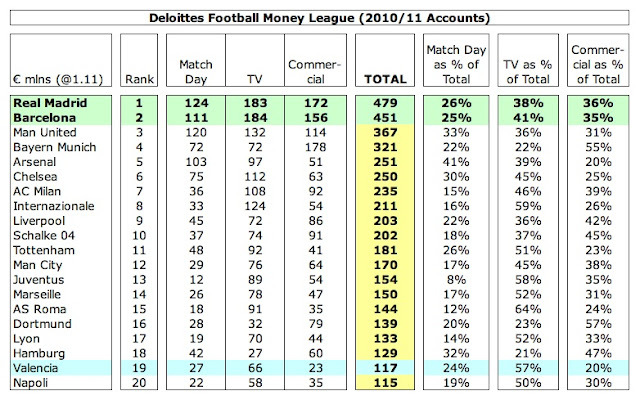 You can see the discrepancy in commercial revenue across the top teams in Europe with this chart from swiss ramble. And if Man United’s potential deal with Nike is any indication, the chasm between the top four clubs and everyone else will only get wider.